Appledore ILB was launched to assist an 18ft motor sailing vessel that had ran aground in the South Tail. The ILB towed the casualty clear and towed it up the river a short distance. The motor sailer then restarted her engine and continued up river to her moorings escorted by the ILB. Appledore ILB was requested to launch to a report of a vessel drifting down the river Torridge and unable to restart its engine. 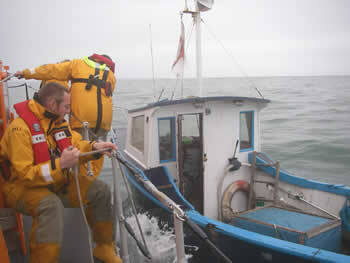 When the ILB arrived on scene they found a small cabin cruiser at anchor with 2 POB fishing. They were in no difficulty and required no assistance, and were waiting for the tide to come to return back to Bideford. The ILB then returned to station and was made ready for service. 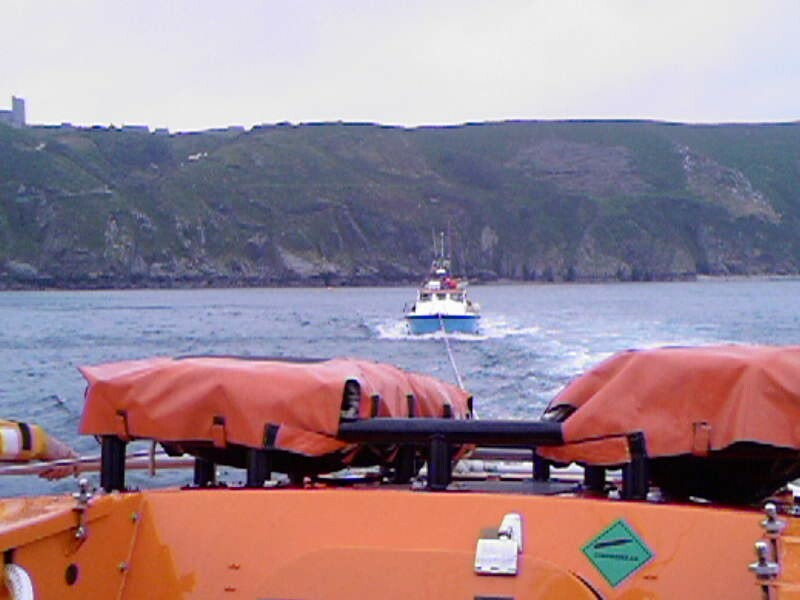 Swansea CG requested the launch of Appledore All-Weather Lifeboat to recover a drifting fishing vessel the 'Emily Rose' reported 4 miles South of Lundy Island, drifting eastwards. ALB launched and towed the vessel to Appledore Quay. The ILB was requested to launch to assist the motor sailer 'Gwendoline' which had suffered engine failure off Hartland Point. In conjunction with the Coastguard and DLa the launch was kept on standby as there was insufficient water for the Lifeboat to launch due to big spring tides. This was discussed with the owner of the Gwendoline who was happy to sail towards the fairway bouy. When there was enough water, the lifeboat launched to the yacht and was towed to Appledore Quay. Crew: M. Cox, K. Wilson, A. Atkinson, O. Atkinson + 2 others. Swansea CG requested the launch of Appledore ILB to a report of a drifting yacht near to the Lifeboat moorings. When the ILB arrived on scene they checked nobody was onboard. It was discovered that the yacht had broken its moorings. The ILB took the yacht in tow and placed it on the RNLI reserve mooring. Both boats were launched after a request from Devon and Cornwall Police, via Swansea CG for a water borne search for a missing male. The man was found near to the lifeboat station at approx. 1810 by the police. All units were then stood down. Small dory, 2 persons on board with engine failure and drifting close to the South Tail. Boarding boat launched and towed boat to Churchfields Slipway, Appledore. All Bristol Channel All-weather Lifeboats requested to be ay immediate readiness, an aeroplane was jettisoning fuel in the Bristol channel due to engine problem. All units were stood down at 14:42. Swansea Coastguard requested the launch of Appledore ILB to investigate a drifting boat near Bideford Old Bridge in order to establish that there was nobody else on board as one person had made his own way to shore. ILB arrived on scene and after ensuring that there was nobody in danger, took the small tender back to the lifeboat station for the owner to collect. Appledore ILB was launched to assist a male who was fishing on the bar, unaware that the tide was rising and he was in danger of drowning. The IB arrived on scene and took the man onboard the lifeboat and returned him to Skern Point beach. Crew: Nick Ayres, Sam Jenkins + 1 other. Appledore ILB was requested to launch by Swansea Coastguard to rescue one adult and two children who were stuck on rocks after being cut-off by the rising tide at Westward Ho! ILB arrived on scene, recovered casualties and landed them at station where Westward Ho! Coastguard were waiting. Appledore ILB was diverted from routine exercise by Swansea Coastguard to a small red fishing vessel having slipped her moorings off Instow Beach. Attended scene to find boat on fore and aft mooring awaiting arrival of Instow Marine who were working on the boat. ILB was stood down and returned to exercise. Appledore ILB launched to assist a local yacht club who were experiencing difficulties in the estuary when a squall raced down the river. The clubs own safety boats were having trouble coping with the weather so the ILB assisted 2 dinghys taking them to safety and 8 persons. Crew: Andy Short, Jeff Pavitt + 1 other. Appledore ALB was launched to assist a 45' motor boat who was suffering intermitent engine failure due to fuel problems 5 miles East of lundy Island. 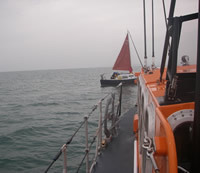 Appledore Lifeboat arrived on scene and escorted the boat 'Almond' back to Appledore. Crew: Alan Tarby (relief cox'n), Keith Wilson, Rich Morne, Andrew Atkinson, Owen Atkinson + 1 other. Appledore ALB and ILB launched to report of red flares on Bideford Bar. The ILB located casualty on South Tail, took 2 people on board and took vessel under tow. Tow was then passed to ALB at 20:59 until clear of broken water on the Tail. Tow taken back by ILB when clear of 'The Bar' and taken with casualties to Appledore at 21:51. Appledore Atlantic 75 launched to search for a missing surfer at Saunton Sands, ILB arrived on scene and after a search the surfer was found safe and well on the beach at Saunton. Appledore ILB was launched to assist a 15' speed boat with engine failure anchored off Crow Point, Appledore. 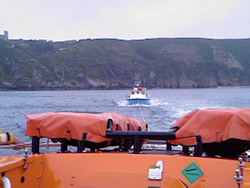 As the ILB left slipway it was reported that a passing boat had offered assistance, but was too late to abort the launch. On arrival at Crow Point the casualty could not be found, it was seen near the Royal George Pub at Appledore from where it was towed to Churchfields car park. Appledore ILB was launched to assist police and coastguards in the search for a missing 83 year old resident of a waterfront house. ILB crew requested help of ALB due to the darkness and the high tide. 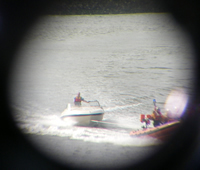 Both boats searched up river Torridge to Bideford. At 23:48 a report of a woman in a night dress in Appledore was received. Both boats concluded search of river at 00:16hrs upon receipt of information that the woman had been found by Coastguards and they both stood down. Other Units Assisting: Westward Ho! CRT, Devon and Cornwall Police, South Western Ambulance Service, Devon and Cornwall Police Helicopter. Swansea Coastguard requested launch of Appledore ILB to an 18ft motor boat with 1 person on board who had suffered mechanical failure between the pulley bouys. The ILB launched and passed a tow line. The vessel was then towed to Curchfields car park from where she had been launched. Crew: Gary Stanbury, Andrew Atkinson, Andrew Hallett. on the East side of Lundy Island. The 3 crew members on-board had been removed by a RIB from the 'Pride Of Bristol' who was in the area at the time and was requested to assist. Appledore, arriving at 1000 hrs. Other assisting units: Lundy CRT, RAF Helo 169, Pride of Bristol. More details: Click here to read the Devon "Western Morning News" Report. Appledore Tyne class Lifeboat 'George Gibson' was launched to assist a 10 metre commercial angling boat 'Lundy Murrelet' who had suffered machinery failure at Lundy island, ( approx 20 miles west of Appledore) The lifeboat launched and arrived on scene, a tow line was passed and the casualty was towed to Clovelly harbour. 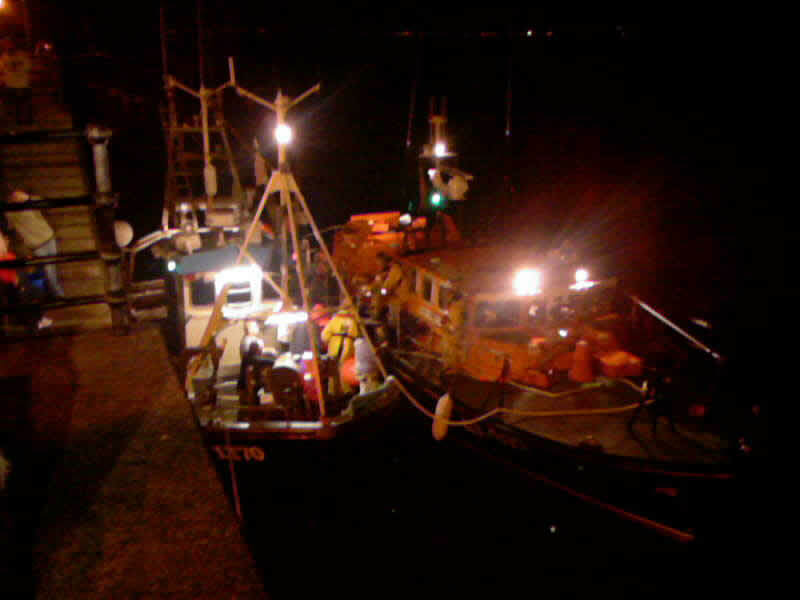 The lifeboat then returned to station and was ready for service at 2120hrs. Appledore ILB was launched after a request from Swansea CG to assist 2 people cut off by the tide on rocks off Puttsborough beach. 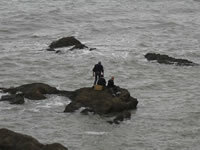 The youths were quickly located, retrieved from rocks where they were then transferred to Puttsborough beach. The ILB then returned to station and made ready for next call. When the ILB arrived on scene they had to put 1 man in the water to swim ashore with a line, as 2 of the casualties were non-swimmers. The ILB was taken over rocks in 1-1.5 meter surf, 2 propellors were damaged but all 4 persons were brought aboard the ILB and brought back to the Lifeboat Station and asfety - where they were made warm & given a health checked. Had the ILB had been called 5 minutes later, the casualties could of been swept out to the sea or seriously injured by the surf and rocks. Crew: G. Stanbury, A. Hallett + 1 other. Other units assisting: Westward Ho! Coastguard Rescue Team,(CRT). had not capsized. The ILB continued to search the area for any vessels fitting the description with nothing untoward found. The ILB was stood down after just over 1 hour and returned to station. This was treated as a false call with good intent. Crew: Gary Stanbury + 2 others. Swansea Coastguard requested launch of Appledore Atlantic 75 to investigate report of a dinghy adrift off Saunton Sands Hotel. When they arrived on scene the dinghy (a small RIB) was ashore. The 2 occupants who had been surfing in the area had apparently anchored the vessel while they went surfing and subsequently recovered it. Request from Swansea CG to launch Appledore Atlantic 75 Douglas Paley to assist a kayak attempting to beach at Saunton Sands. ILB launched but kayak occupant had swam ashore unaided. Attempts to recover kayak abandoned as risk to ILB and crew were considered unnecessary. Kayak subsequently drifted on to rocks at Saunton, ILB returned to station. Swansea Coastguard requested the launch of Appledore ILB to a report of people possibly cut off by the tide at the bottom of cliffs near the Shipyard, as 2 dogs had been found., (1 on the footpath and 1 at the bottom of the cliff). The ILB put ashore 1 crewmember who searched the area and found no-one. The 2 dogs were recovered to the ILB and brought to the station. It later emerged that the dogs had escaped from a near-by garden and the owners were safe and well. They later came to the station to recover the dogs. Crew: Andrew Hallet, Gary Stanbury, Andy Short. Swansea CG requested launch of Appledore ILB to a report from Croyde CG mobile that they had spotted 2 people in the water between Instow and Crow Point. When the ILB arrived on scene they found 2 persons in the water holding on to 1 lifejacket, and then spotted a small speed boat towing a kneel board with 1 person on. The ILB crew spoke to the person in the boat which could only take 1 person so the others were put into the water to wait their turn! After a brief chat with the people, informing them that the emergency services were out to assist them they were returned to the shore to waiting coastguards. Other units assisting: Croyde CRT, RAF Helicopter 169. Swansea CG requested the launch of Appledore ILB to a broken down Yacht between Instow and Crow Point. The yacht had previously been aground for the day on a nearby sand bank, and coastguards were watching the vessel float on the next incoming tide when its engine failed. When the owner tried unsucessfuly to re-start his engine he anchored his yacht and called for assistance. The ILB placed a crewmember on board and towed the yacht to Instow Quay. Crew: Andrew Atkinson, Andrew Hallet, Andy Short. Swansea costguard requested launch of Appledore Inshore Lifeboat to a report of 1, possibly 2 jet ski in trouble on Bideford bar. When the ILB launched they spotted 2 jet ski heading up river and investigated these. When all was well they proceeded to the bar area to check that there were no more jet skis in the area before returning to station. left casualty as it was back functioning on own power and had left site. Apparently the jet ski had a reserve tank of fuel!! Launched to a Fishing Vessel who had broken down on the bar at Appledore, Tyne Class Lifeboat launched and proceeded to scene. When contact was made with the vessel on VHF radio they informed that they had got their engine started again but were still not happy with it and were returning to the Fish Quay at Appledore. 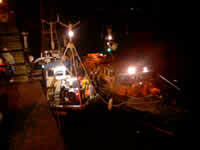 Lifeboat escorted vessel to Fish Quay and returned to station. 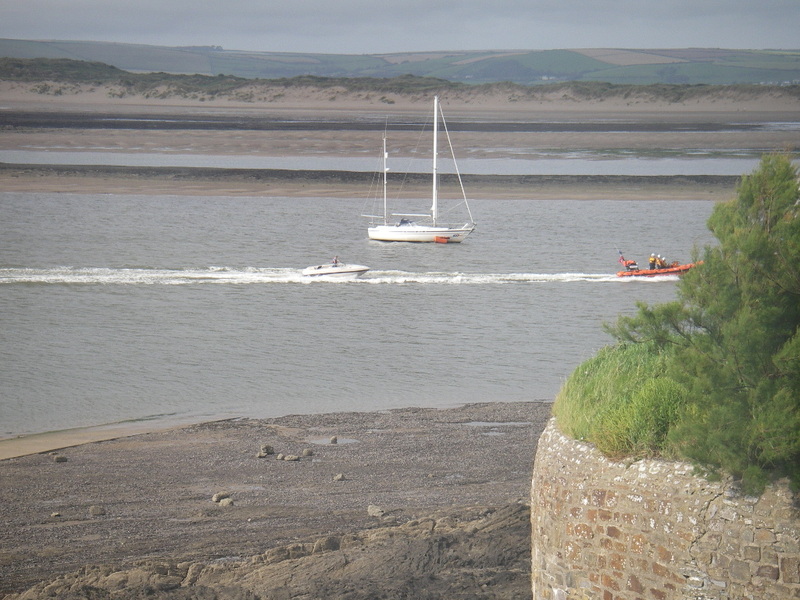 Due to state of tide Appledore Boarding Boat was launched to assist 6 people cut off by the tide at Fremington Quay. As boarding boat neared the area, the first informant (an angler) advised the Coastguard that the casualties had waded to shore at Penhill Point. After confirming that all casualties were safe and well the boarding boat stood down and returned to station. Small dinghy with 4 POB overdue from Iron Bridge in river Torridge, Appledore Boarding boat and Rescue Helicopter 169 were tasked. Boarding boat arrived on scene and did a quick search of the river. People on board had made it to shore without help. All safe and well. 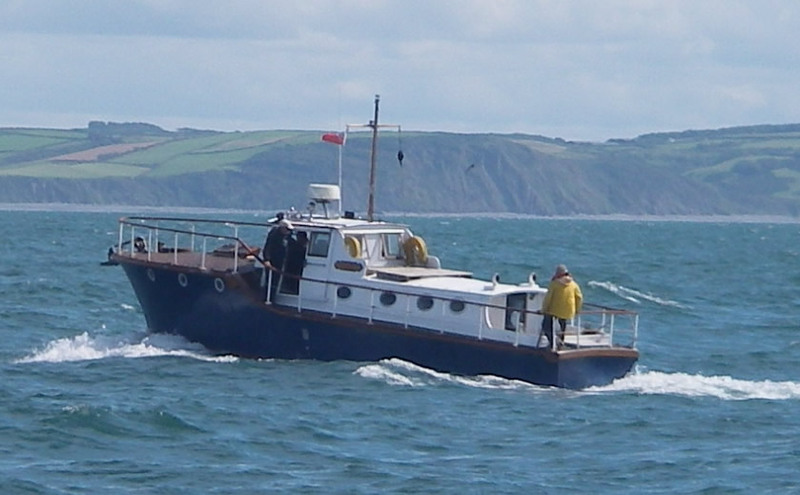 Vessel reported lost in Bideford Bay after returning from Hartland. Tyne Class All Weather Lifeboat launched after request from Swansea CG to investigate a vessel unsure of it's position. Vessel Neptune was standing by the casualty. VHF direction finder was used to get accurate bearing from Lifeboat then an exact position was gained via Neptune to pin point the casualty, which was off Morte Point, approx 8 miles North of Lifeboat station. 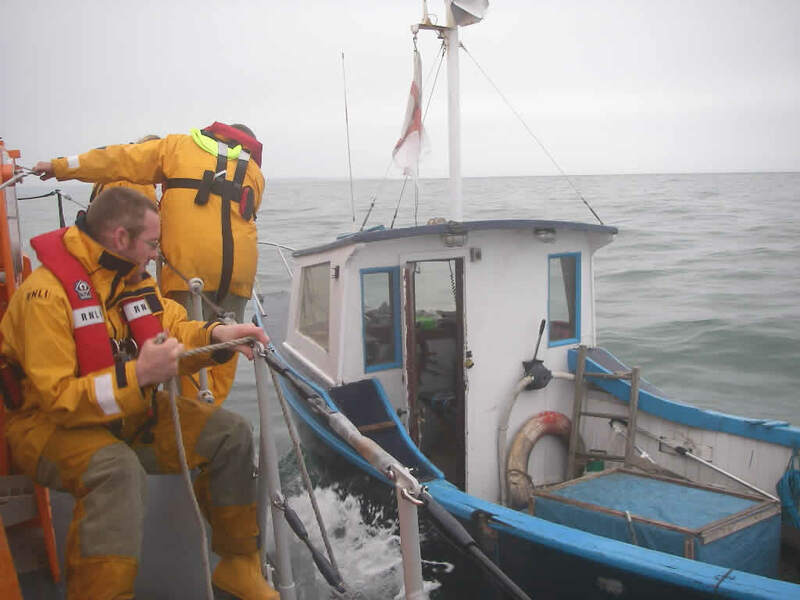 Once the Lifeboat arrived on scene a crew member was placed on board the casualty to help steer her back to Appledore, with the Lifeboat escorting. The crew memeber was taken off the casualty at Appledore and the vessel continued up river to her moorings at Bideford. boat was launched and proceeded to scene. 2 persons on board found fit and well. 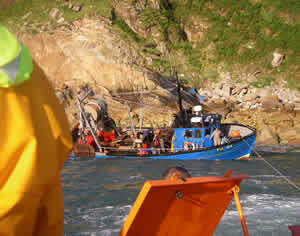 2 men were removed from vessel and brought ashore in the boarding boat after securing the vessel. The men were later returned to their boat when the tide had risen enough to re-float the boat. Appledore RNLI’s Atlantic 75 lifeboat launched at 0825 hrs on Tuesday May 1st 2007 following reports of a small dinghy adrift in Bideford Bay. Swansea Coastguard received a report from a passing vessel that a small dinghy had been spotted drifting out into Bideford Bay.The Atlantic 75, Douglas Paley was launched and proceeded to the area to search for the dinghy, which was found with nobody onboard and a painter line attached.The ILB then recovered the dinghy and returned to station, checking the area on their way back.